I’m still on the road, travelling through Nebraska, where corn is king. 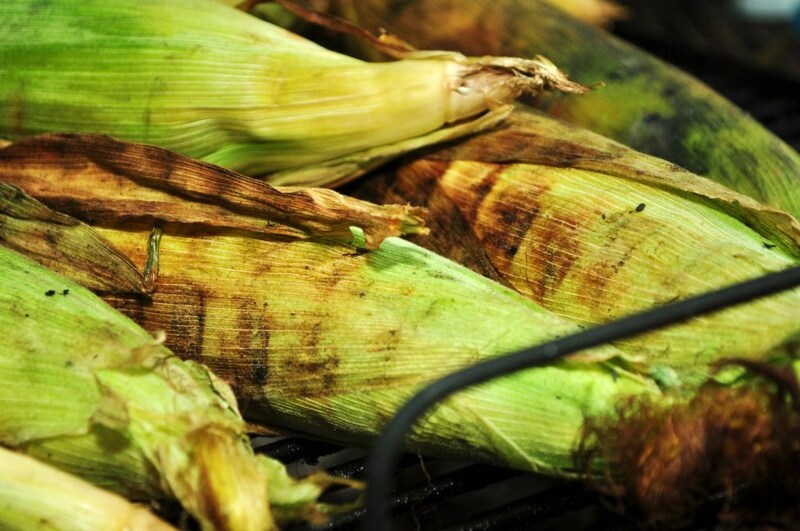 We had some great grilled corn this weekend and made the fruit salad for a family get-together yesterday. Both always go great with marinated chicken breasts. This marinade works best on the grill because it caramelizes well over an open flame and that gives its signature flavor. Add all ingredients into zip-lock bag and thoroughly coat & let marinate overnight. Grill (or roast in the oven at 375° in a large baking dish). 15 minutes each side, 185° internal temp. When grilling, to avoid drying chicken out, sear for 5 minutes each side, cook additional 10 minutes, then move away from high heat for rest of cooking time. To make ahead, add chicken and marinade ingredients together and freeze. Pull out and thaw in the refrigerator the night before. Thinly slice each potato, layer one on each piece of foil, then layer sliced onion and parsley or chives. Melt butter and add garlic, drizzle equally over each potato. Wrap and seal foil. Grill, turning halfway through (about 15 minutes each side). Cook until potatoes are tender and onions crispy. Mix pineapple, sliced banana, orange slices, grapes & shredded coconut with 4 oz ginger ale.